Being the largest city in South Africa and one of the 50 largest urban areas in the world, Johannesburg city is known for preserving its industrial heritage. It is considered to be Africa's economic powerhouse. In order to create the required skilled resources for the industry, KnowledgeHut Academy offers the CSD certification in Johannesburg through classroom training. The CSD training in Johannesburg is an intense 5-day workshop conducted by adept trainers. The workshop starts with an introduction to CSD basics on Agile; Scrum basics, Roles, Ceremonies, and Sprint. The CSD elective topics are taken on the second day; it is comprised of Behaviour Driven Development, Acceptance Test Driven Development, Gherkin, Selenium, and Fitnesse. In the CSD certification in Johannesburg, lectures and practice sessions is conducted on daily basis. The course covers SOLID design principles, design patterns, and collaboration skills. The last session of CSD course in Johannesburg covers discussions on Continuous Testing, Inspection, Deployment, and Feedback with demo and exercise on Continuous Integration. In addition to the cost benefit, the CSD training in Johannesburg offers detailed course material approved by Scrum Alliance and downloadable e-book for a quick reference. Depending on the duration of the course, you will be entitled to get certain PDUs and SEUs. The course has boosted the careers of hundreds of certified professionals and the exam fee need not be paid as it is included in the course fee itself. The Certified Scrum Developer Training in Johannesburg is brought you by the KnowledgeHut institute, which is recognized as one of the Global Registered Education Providers of Scrum Alliance. 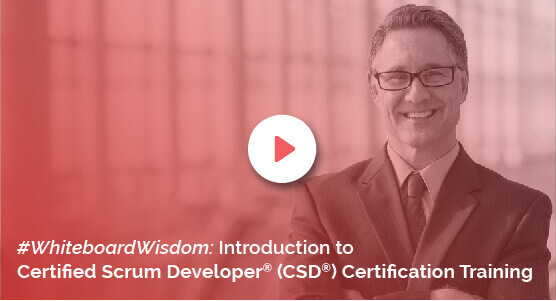 Register for a demo session to learn more about Certified Scrum Developer Certification in Johannesburg.